We bought our bed last fall, back before we moved into our new house. I found it at JC Penney Outlet for $200. I had seen an extremely similar bed at Restoration Hardware for around $2,000, so $200 sounded really good to me. I loved how simple and classic it is -- and I still do, but with our color scheme in our room it's a little dark and heavy with nothing else in the room to balance it out. I've been trying to figure out how to lighten it up, but didn't want to paint it. 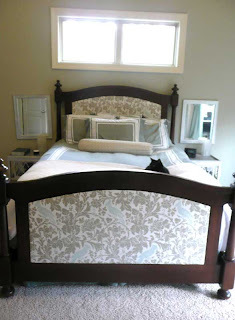 I love the look of upholstered head- and footboards, and I really wanted to add a light fabric to soften things up. Remember this fabric? Well this is what I had in store for it! 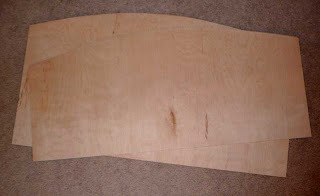 We picked up some 1/8" plywood at Home Depot and cut it to size using our craft paper pattern. I upholstered them with some batting and the new fabric. And then used a few 3M velcro strips to attach it to the bed. It's been up for a few weeks now and is holding just fine! 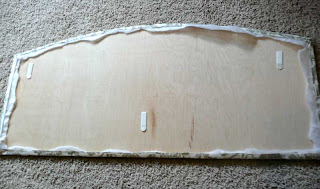 This really is a wonderfully easy, cheap project and it makes such a huge difference! Looks absolutely amazing! Thanks for sharing. wOW! How creative is that! That is awesome! 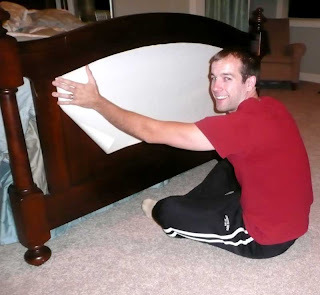 I have a 4 poster with a square headboard, if it ever needs "softening up" I'm going to use this idea, it's great! pretty bed! and it looks even prettier now. good job! how fabulous are you?????? i love it!! This looks so great! Such a small change, but huge impact. So pretty! Really softens and lightens the bed. Great job! Wow! What a transformation! I love this! Great idea! Question though, did you find your BEDDING for $200 or your actual bed frame for $200? Because that would be a crazy good price if it was your bed! That is awesome! I think I'm going to have to try it--and I LOVE that fabric! Might have to steal that idea,too! Bravo! You've done it again! Looks great! Love the color! That looks so good! 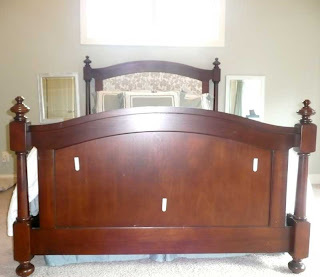 Now I REALLY want to find a headboard for my bed! Holy cow! It looks amazing! I love that it's not permanent and you could always change the fabric if you wanted. It seriously looks very high-end and gorgeous! I love the fabric you used, too. Beautiful! I love that fabric. What a creative idea. LOVE! And I love the velcro strip solution, too! What a clever girl! I love when people take something and make it all their own. It actually made the bed look very expensive. Great job! That's amazing the difference that made. I don't even have a headboard or footboard bc I can't find just what I want. 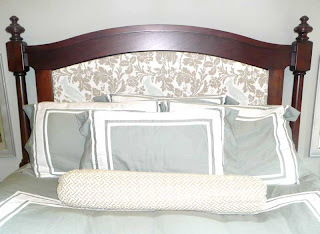 I finally decided to make my own upholstered headboard; but now can't decide which fabric to use! That looks amazing. And what a great tutorial...my wheels are spinning now. Your bed looks fantastic! I like the idea of being able to put the panels on without them being permanent. Beautiful. Love that it is not permanent. This is so amazingly beautiful! I am filing this idea away at thecraftersfilebox.blogspot.com. That is such a great idea - I love it!! That looks amazing! Great job. Looks beautiful! What a great idea. Now that it's colder we can put our imagination to work indoors throughout the winter months. If this is any sign of what you'll be producing, I'll be back often!! That is awesome! 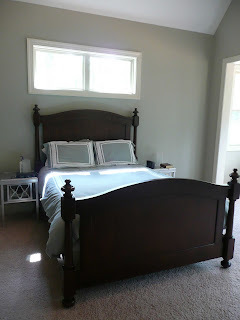 Now I'm wanting to redo my sleigh bed! ;) You're always so inspirational! That looks great! I've been thinking of doing that same thing to my bed, now seeing how it easy you make it look- I feel encouraged. Great job, it looks so great. OMG I totally love it. It totally lightened up and added a classic look to the bed. Beautiful Britt! I can't begin to say how fantastic this idea looks. It totally transforms and makes the bed soooo elegant! It's totally gorgeous! What a great idea, it looks fabulous! 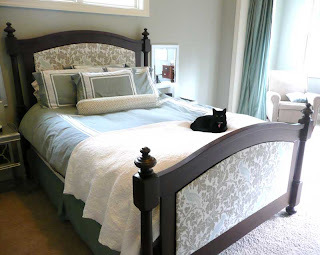 I've been wanting to do something similar to our bed, glad to know it can be done, thanks for sharing. Gorgeous job on this bed. You are awesome at thrifty, but stylish makeovers. You should post this to my Furniture Feature Friday link party and giveaway this week! Hope to see you there! Love this idea. With one more bedroom to furnish, this opens up a whole new avenue for furniture possibilities. WOW Britt! I love the upholstered panels! I love the colors, patterns and textures in your room. Your entire home is an inspiration to me.